It’s late Thursday afternoon and the gray ribbon of highway before us is cloaked with bumper to bumper gridlock. We inch along in our little red rental, butting up to suburbia vans, luxury Lincolns, and rust-bucket half tons, all who have the same purpose in mind. To get where they’re going, and as quickly as possible. Although we’re quite familiar with rush hour in our own bustling metropolis, the surrounding vista reminds us that we’re not at home. The natural beauty of the Sonoran Desert embraces the cosmopolitan city of Tucson that sprawls over 495 square miles. Signature Saguaros stand at attention with their arms stretched skyward, proudly displaying their heritage. They unite with thorny cholla, spiny ocotillo, and other desert cacti that dominate the desert floor. Our freeway artery that bisects the desert plains pulsates like percolating adrenaline, yet once off the beaten track, this spread-out city exudes more of a laid-back desert-town feel. Pueblo-style buildings with red tiled roofs depict Tucson's Native American and Mexican heritage and several verdant parklands beautify plazas and pathways in the city’s hub. Although stimulated by the many cultural offerings, shopping opportunities and bustling downtown core, our mission on this visit is to get away from it all, find reprieve from the busyness and enjoy a taste of pure escapism. This we find, and more, at Arizona Inn. Tucked into a quiet residential area, this posh property looks more like a family estate than a boutique hotel. The homey feel flows beyond to refined interiors where memorabilia and photographs evoke images of yesteryear and tales from long ago. 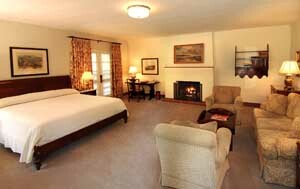 As well as exuding an aura of old world elegance and charm, the ambience is genteel, and hospitality is gracious. This five star treasure was the original vision of Arizona’s first congresswoman, and founder, Isabella Greenway. Out of compassion and benevolence, her journey began with The Arizona Hut, a furniture factory, where disabled vets from Word War 1 were trained and paid to craft fine furniture. Following the stock market crash in 1929, however, her business fell into financial despair. With an opportunistic vision, Isabella shifted her energy in a different direction so that her furniture would still be in demand. 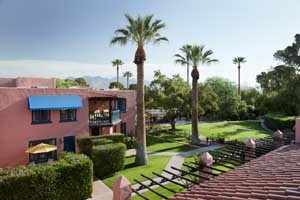 She oversaw the construction of the Arizona Inn and opened its doors in 1930. We arrive just in time for afternoon tea and while dining on dainties served on fine bone china, we admire the cozy library décor that mirrors the elegance of a bygone era. Exquisitely preserved antiques and family heirlooms unite with walled tapestries and original oils. 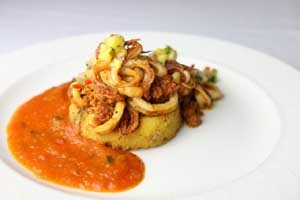 Adjacent is the formal dining room where gastronomical magic happens three times a day. Succulent calamari, and seared sea bass topped on lobster asparagus crepes, are just a couple of the innovative dinner options in store. From the outdoor patio, we gaze over the palatial grounds where a crochet match is in progress. Brick and mosaic-tiled pathways border the meticulous gardens while taking us en route to two Har-Tru tennis courts, a shimmering pool, the high tech fitness centre and our intimate southwestern-style casita. Some have fireplaces, some decks, and all embrace the utmost privacy. 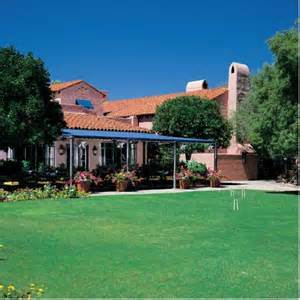 With more than two hundred employees and fourteen luscious acres, Arizona Inn, as we discover, offers exceptional service along with the discreet privacy that we have come here to find. As well as hosting celebrities and dignitaries who seek reprieve and relaxation, the Inn has earned a raft of accolades to be proud of. The New York Times has named it “The Jewel of the desert.” Zagat survey of top US hotels Resorts and spas has listed it as one of the top fifty small hotels. 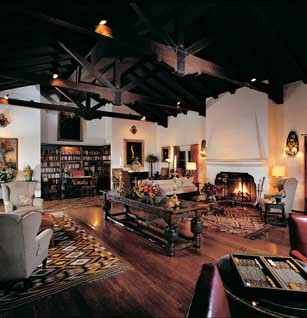 Conde Naste has it on their Gold List as “One of the world’s best places to stay” And after our two-night Tucson stay at this historical gem, we both agree, it’s a taste of true escapism.